Actor and illustionist Geoff Sobelle calls his one-man show The Object Lesson a "meditation on our relationship to things, and to objects and stuff." Before the evening's performance, actor Geoff Sobelle said he wondered why no one had ever tap danced while wearing ice skates. 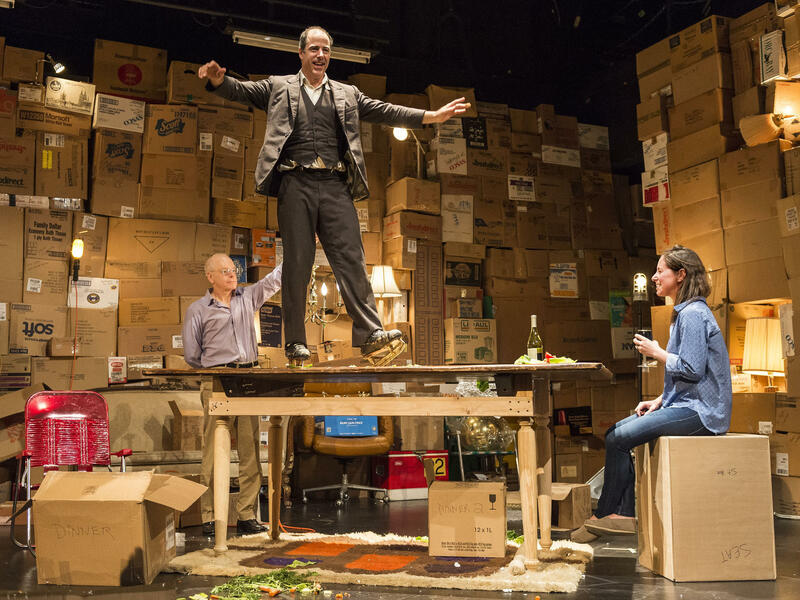 In The Object Lesson, he does just that — on a table. Boxes of all shapes and sizes are everywhere — on the floor, covering the seats, stacked halfway to the rafters. 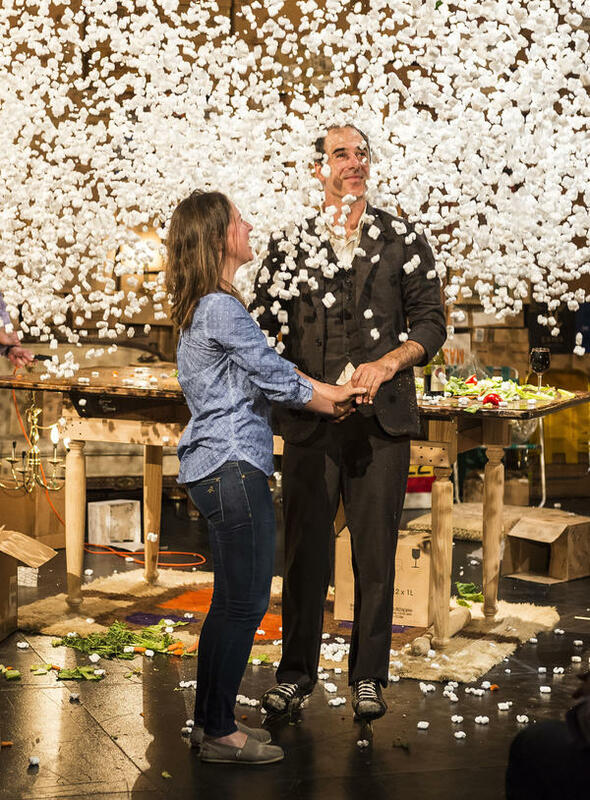 After a dinner date, complete with ice skate tap dancing, Geoff Sobelle and his audience member "date" gets showered with packing peanuts. Sunday is my last broadcast as host of Weekend All Things Considered at NPR West. I'm moving back to Boston, and with packing well underway, after the broadcast I'll be sleeping between piles of hastily labeled boxes. Weirdly, a couple of weeks ago I experienced a nightmare version of this very scene, when I attended a show called The Object Lesson at the Kirk Douglas Theatre in Culver City, Calif.
"This is not respectable theater. I don't even know if it is theater," jokes Geoff Sobelle, the creator and star of the show. Sobelle, whose background is in performance art and magic, has transformed the inside of the theater: There's no distinction between stage and seats, between performer and audience. Boxes of all shapes and sizes are everywhere — on the floor, covering the seats, stacked halfway to the rafters. And most of those boxes are labeled — "report cards," "8th through 12th grade," "packs of incomplete playing cards" — not that that helps make sense of anything. There's no stage as such; the audience and performers are all in the same space. The only place to sit is the floor, or on the boxes labeled "seat." Everyone is encouraged to open up the boxes, see, touch, even smell what's inside — all before Sobelle even enters the space. Thanks to the interaction with these weird, wonderful and random objects, by the time he does appear, the wall between him and the audience is already down. As Sobelle flits among his objects, which bring out stories and monologues — he's interacting with all of us. Some are called upon to provide a catalogue of their own objects — the contents of purses or pockets. At one point, an audience member was asked to answer the phone. Before she knew it, she was on a dinner date with Sobelle. He made her dinner using a random assembly of what's around — a table, a box of food and a pair of ice skates, which he used as cutlery. "It's meant to be an improvised, crazy night that you don't expect," says Sobelle, "but somehow all these things come together and you have this inspiring night of romance." The audience member was such a great sport, I actually thought she was a paid actor, but she was just one of us. The weirdest thing about it all is that when the scene ends with the couple breaking up, there's a real, palpable emotional moment — even though it's all total theatrical fakery. 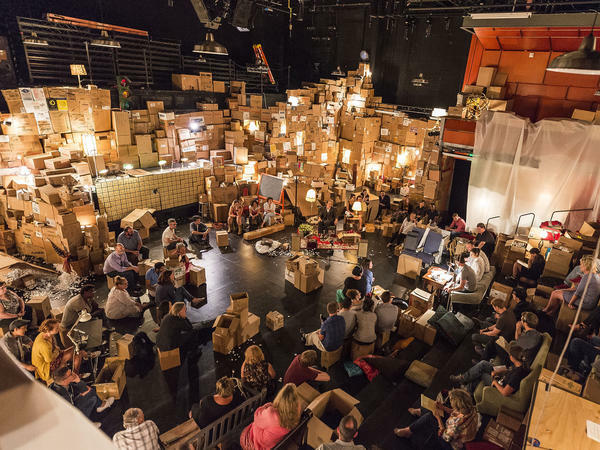 "By going up to somebody and having them have a real experience, they've just performed a kind of documentary of seeing their own house in boxes," Sobelle says. He says it happens every time, and not just with the people he pulls up to perform. This show is weird and fun, but Sobelle says there's a real point to it all. "It's a meditation on our relationship to things, and to objects and stuff." He says he was inspired by George Carlin's 1986 stand-up routine, in which Carlin comments on society's obsession with stuff. "That's what your house is: a place for your stuff with a cover on it," Carlin says in the monologue. Sobelle is constantly amazed at how easily people attach their own meaning to the thousands of objects he's assembled. At one recent performance, a woman in the audience latched onto one particular object and wouldn't let go. It was a figurine of an AT-AT, the four-legged walker from Star Wars. "She was cradling this AT-AT like it was a puppy," says Sobelle. "The whole show, for like an hour and a half, the whole time, she's walking around with it. It was very mysterious, the love this woman had for an AT-AT. I just thought it was really cool." As I pack up my life into boxes, I feel deeply for that woman with the AT-AT. It's not just a Star Wars toy: It's your son when he was 6, your lover's odd sense of humor or that family vacation from 1987. The power, the value of objects — unless they're made of gold — come from our memories. Try throwing those away. This is my last ALL THINGS CONSIDERED broadcast from NPR West. I'm moving back to Boston. Tonight, I'll be sleeping between piles of hastily labeled boxes. Weirdly, a couple of weeks ago, I experienced a nightmare version of that very scene at the Kirk Douglas Theatre here in Culver City. GEOFF SOBELLE: This is not respectable field. I don't even know if it's theater. RATH: That's Geoff Sobelle, creator and start of "The Object Lesson," talking before a recent performance. His background is in performance art and magic, and he's transformed the inside of this theater. There's no distinction between the stage and seats, between performer and audience. Everywhere - everywhere - are boxes of all sizes, shapes, on the floor, covering the seats - boxes stacked halfway to the ceiling. Most of the boxes are labeled, not that that helps make sense of anything. SOBELLE: Report cards, parentheses, 8th through 12th grade. Acorn collection - that's a - that's a big box an acorn collection. Packs of incomplete playing cards. RATH: There's no stage, as such. We're all in the same space. The only places to sit are the floor or on the boxes that are labeled seat. Before Sobelle makes his entrance, we're instructed to examine his boxes, look at the stuff inside, touch it, smell it and listen closely. Wait, here's case with an old cassette recorder. It's playing. It's someone talking in French. Thanks to the interaction with these weird, wonderful and random objects, by the time Sobelle appears, the wall between him and the audience is already down. SOBELLE: The last thing I wanted was for some people to come and sit in a cushy seat and look at a curtain and listen to music and look through a program and wait for the show to begin. RATH: When Sobelle flits among his objects, which bring out stories and monologues. He's interacting with all of us. Some are called upon to provide a catalog of their own objects - whatever's in your pocket or purse. One woman is asked to answer the phone. RATH: Before she knows it, she's on a dinner date. SOBELLE: (As character) Yes? Hello? And then gets pulled into the action of the play. SOBELLE: (As character) Yes. Yes, it is. RATH: Sobelle makes her dinner, using a random assembly of what's around. He pulls out a table, a box of food and a pair of ice skates. SOBELLE: So I'm scrambling, and I proceed to make her a salad, but the only cutlery I have are my skates. And it becomes a whole tap dance routine where I make her a chopped salad to Al Bowlly's "All I Do, The Whole Day Through, Is Dream Of You." And it's meant to be, like, an improvised, crazy, romantic night that you don't expect. And, you know, somehow, all of these things come together, and you have this singular, inspiring night of romance. RATH: The woman he's pulled up is such a great sport, I actually thought she was a paid actor, but she's just one of us. The weirdest thing about it all - when the scenario ends with the couple breaking up, there's a real, palpable emotional moment, even though it's all total theatrical fakery. SOBELLE: By going up to somebody and having them have a very real experience, they've just performed a kind of documentary of seeing their own house in boxes. RATH: Sobelle says it gets real every time, and not just with the people he pulls up to perform. It's fun, but what's the point? SOBELLE: It's a meditation on our relationship to things and to objects and stuff. And one of the big inspirations was George Carlin's brilliant routine about all of our stuff. RATH: I was thinking about that when I walked in here for the first time. GEORGE CARLIN: That's the whole meaning of life - isn't it? - trying to find a place for your stuff. That's all your houses are - a pile of stuff with a cover on it. It's a place to keep your stuff while you go out and get more stuff. RATH: Sobelle is constantly amazed by how easily people attach their own meaning to the thousands of objects he's assembled. SOBELLE: From "Star Wars." Yeah. RATH: The things that look like metal dogs. RATH AND SOBELLE: "The Empire Strikes Back." SOBELLE: You got it. Exactly. So there's a toy AT-AT over there that I remember as a kid, it was, like, my prized possession. But this woman came in the other night, and it's funny 'cause she's not exactly the, like, demographic that I would peg as, like, the big "Star Wars" fan. But she was cradling this AT-AT like it was a puppy. SOBELLE: And she - the whole show, for, like, an hour and a half, she's walking around with it. Anyway, it was very mysterious - the love that this woman had for at AT-AT. I just thought it was really cool. RATH: As I pack up my life into boxes, I feel deeply for that woman with the AT-AT. The power - the value of objects, unless they're made of gold, come from our memories. It's not a "Star Wars" toy. It's your son when he was six, your lover's odd sense of humor or that family vacation from 1987. Try throwing that away. 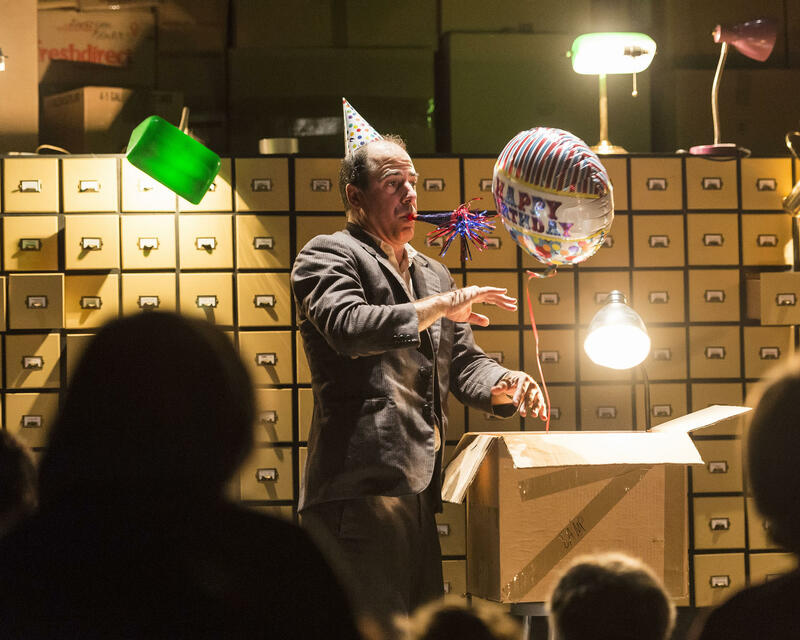 "The Object Lesson" runs until October 4 here in Culver City at the Kirk Douglas Theatre, then it'll go on tour across the country. Transcript provided by NPR, Copyright NPR.